Sooner or later every CAD application developer has to solve the problem of saving auxiliary non-graphical data in .dwg drawings. It can be attributes for a single graphical entity or layout or settings for a whole drawing. Unlike block attributes, this data is hidden from a user and used for programmatic processing of drawings. There are a number of ways to solve the problem, for example, adding XData objects to drawing’s entities, using XRecords objects, or creating custom non-graphical objects. In comparison with the traditional approaches, the mechanism provided by MultiCAD.NET API is much more compact and easy-to-use. It is also unified and can be applied in the same way for different object types in a drawing: entities, layouts or a whole drawing. Using this mechanism you are able to create and save auxiliary information of any data type. Now all added TextInBox entities are drawn in compliance with the document’s properties. This entry was posted in General on September 16, 2014 by DevClub. In the previous post we talked about importing point coordinates from an external text file into a .dwg drawing using classic .NET API. This post is going to describe how easy this problem can be solved using the cross-platform MultiCAD API. Here you will find the specifics of building MultiCAD application and the simple steps to launch it in nanoCAD and AutoCAD without changing project settings and rebuilding. To set up the project you only need to add a reference to the mapimgd.dll library that is included in the nanoCAD SDK (starting from version 4.0). The project configuration remains the same for applications that run in nanoCAD as well as in other supported CAD programs, particularly in AutoCAD. This compares to the previous project that contains two configurations — Debug NCAD and Debug ACAD. This project will use the only Debug MultiCAD configuration for all cases. You can see that the number of code lines required for implementing this method has been decreased significantly. With MultiCAD.NET creating point objects, setting their coordinates and adding them to the database requires only three code lines! This is an extra advantage in addition to cross-platform support, using the API you can make application code more compact. This is carried out by “embedding” auxiliary operations into the main functionality. Here we have created a DbPoint object, set its position and used the DbEntity property to move to the database level and add the point entity to the drawing’s database. Note, there is no need to determine which working space is current, the AddToCurrentDocument() method automatically finds the active document and adds an entity to currently used space. After the code is built and an application .NET assembly is generated you can load it and run in the supported CAD-programs. Loading applications to nanoCAD is performed by the standard NETLOAD and APPLOAD commands. To load applications to other systems, the special application called Object Enabler should be used. For example, to load an application to AutoCAD, MultiCAD Enabler for AutoCAD should be loaded first, and then use the NETLOAD command for loading your application. This standard MultiCAD Enabler for AutoCAD can be downloaded from the nanoCAD Developers’ Club. Source code of the project is available here. This entry was posted in General on September 1, 2014 by DevClub. One of the popular questions concerning writing programs for nanoCAD is the question “how to import points from a text file to nanoCAD?”. This programming problem isn’t difficult for software developers but it can be a struggle for design engineers. That’s why we decided to write this post for beginners who are doing the first steps into the nanoCAD programming world. 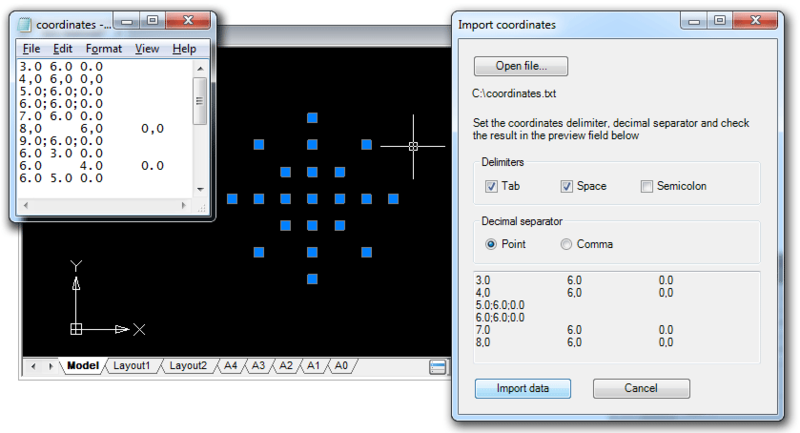 Importing point coordinates to a drawing can be done using any type of nanoCAD APIs. We’ve decided to choose the .NET APIs and compare both of them; the classic .NET API and cross-CAD-platform MultiCAD.NET API. This post is the first part of this comparison that describes the point import process with the classic .NET API. Given: a text file that contains point x-, y-, z-coordinates, one point per line. Coordinates are delimited by spaces, and a period (.) is used as a decimal point. Required: an application with the IMPORTCOORDS command that prompts the user for a filename, imports coordinates from an input file and creates DatabaseServices.DBPoint objects in current drawing space. 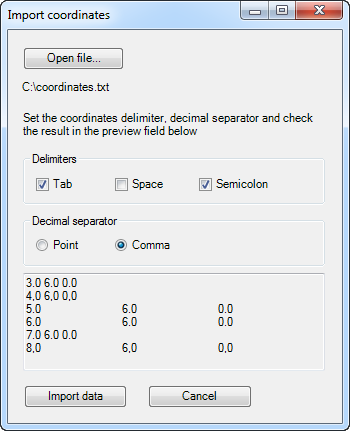 Point coordinates must be converted into the current user coordinate system (UCS). Microsoft Visual Studio 2008 (nanoCAD 3.5 — nanoCAD 5.0 supports loading .NET application built with .NET Framework 3.5). It is assumed that you have a little programming experience and you are slightly familiar with C# language. If not — you are welcome to the library. The application that can be loaded and run in nanoCAD is a common .NET assembly (DLL). That’s why we use this template. Now all preparations are complete and we are ready to get into code writing. Get the database and command line editor of the current drawing. Prompt the name of the file that contains point coordinates. Open the file and read lines with coordinates. 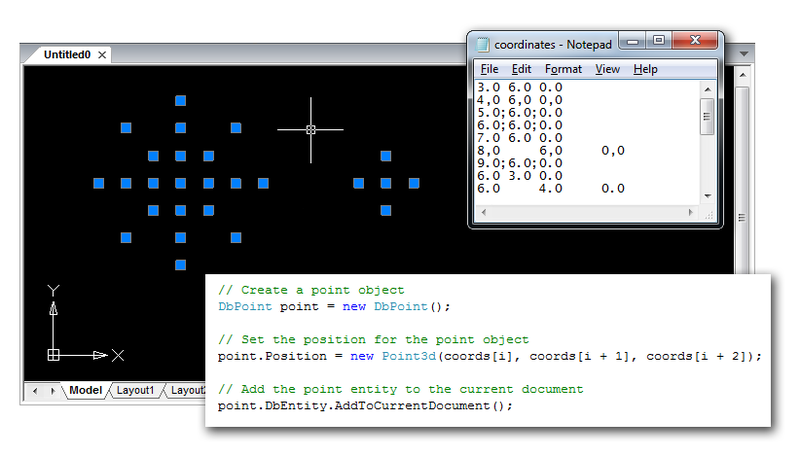 Create DBPoint objects by the given coordinates. Transform objects coordinates from the world coordinates system (WCS) to the current user-defined coordinate system (UCS). Add created objects to current drawing space: model space or paper space. Before we proceed with the code, let’s discuss briefly what the “database of drawing” is. Internally, .dwg file is a database with the strict hierarchical structure, where the main container objects are so called Symbol Tables that hold all database objects. It’s not only graphical objects that you can see on the drawing (lines, arcs, points, etc. ), but also non-graphical objects that define contents and settings of the drawing. For example, the Layer Table contains all drawing’s layers, the Linetype Table stores all line types defined in the drawing, the UCS Table is the container for all user defined coordinate systems for this drawing and so on. Thus “to create a new object in the drawing” means to create proper database object. At the first step we need to determine from all opened drawings the active one and obtain its database. For this purpose we will get the manager for all opened documents and then use it for getting the drawing database. // then convert array elements to numeric value of double. As for graphic primitives, they exist in a database only within separate blocks which are stored as records in the Block Table. Such an approach is an efficient way to group a number of objects to named blocks and manipulate them as single units. In other words a container object for an entity is a separate Block Table record that belongs to its parent object — the Block Table. Note also model space and paper space in the drawing are also represented by specific blocks. Since we process the database we need to talk about data integrity. We must guarantee that its structure won’t be damaged if something goes wrong during the runtime. For security purposes the transaction mechanism is used. A transaction encapsulates a number of operations and can be treated as an entire operation. If something goes wrong then the transaction is cancelled and all the objects that have been created within the transaction will not be added to the document. If all operations inside the transaction are completely done, the transaction is committed and all objects are added to the database. Now with this knowledge base you are able to create point entities by coordinates derived from the file and add them to the current drawing space. Now the application code is done. What is next? It’s time to talk about how to load the application to nanoCAD. We’ve created a working project with DLL type of generated output, therefore after compiling is completed you will get the .NET assembly with the name of the project. Open nanoCAD, input the NETLOAD command and choose the generated library. 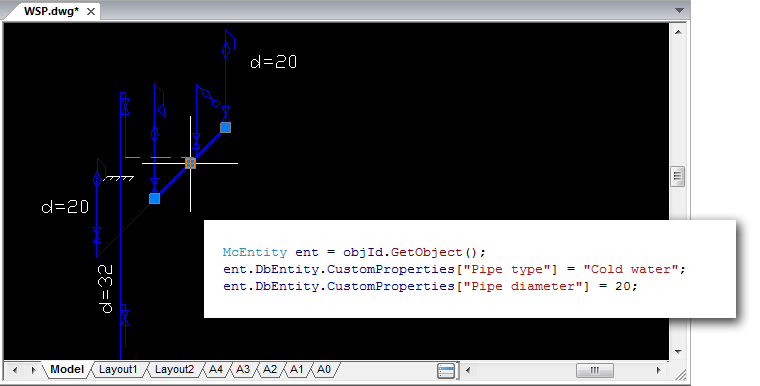 Note that unlike AutoCAD, nanoCAD uses the APPLOAD command for loading applications of different types including .NET. After the DLL is successfully loaded, run the IMPORTCOORDS command to launch the application. Let’s improve the application by adding useful functionality and GUI elements. As for a decimal point, a comma or a period can be used; coordinates will be imported in a culture-insensitive manner. The IMPORTCOORDS command will open a modal dialog so that the user can choose the input file and proper import settings. With these controls the user is able to set all required import settings, preview import result and run coordinate import process. Both project versions are available here. Replace namespaces in the code with the proper alias defined above: Platform and PlatformDb. Use the #define ACAD directive to define AutoCAD as a target platform, nanoCAD is defined by default.